Good morning ladies and gentlemen of the jury. Your Honour, I stand before you and the court today to present a scandalous case, one which weaves a tale of shame and denial. The defendant claims to be a fan of story-rich visual novels and thrilling detective games, and yet they have not played the first, second, or even third game in the Phoenix Wright: Ace Attorney collection. Please settle down! I understand the shocking nature of this crime but I’d ask for the court to refrain from further outbursts. 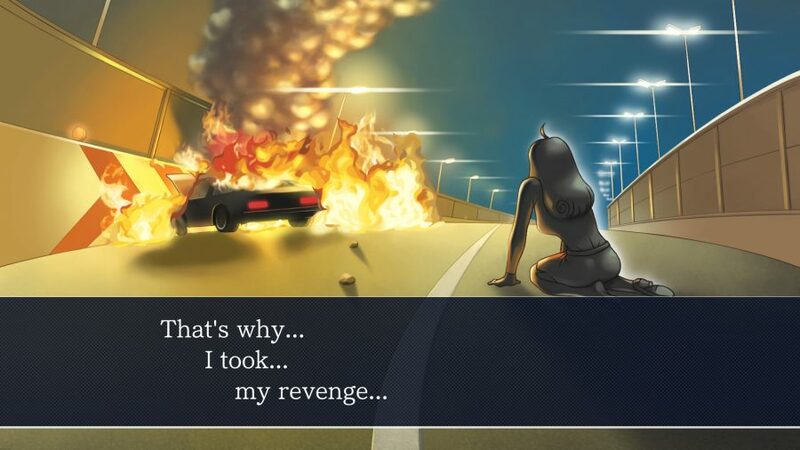 That said, the Phoenix Wright: Ace Attorney Trilogy is a staple of detective visual novels and it is indeed disturbing that the defendant has so nonchalantly brushed the original Ace Attorney trilogy aside. I’ll keep my argument short, Your Honour, and I will put forward to the members of the jury why the defendant must immediately be reprimanded. You see, now that the trilogy has been released on PC the defendant has no further excuses, and nowhere left to hide. The aforementioned collection includes the first game, Phoenix Wright: Ace Attorney, the second game Phoenix Wright: Ace Attorney – Justice for All, and the final game in the trilogy Phoenix Wright: Ace Attorney – Trials and Tribulations. If the defendant should be found guilty of their crime I ask you to give them a minimum sentence of playing the complete trilogy from beginning to end via the conveniently bundled PC collection that Capcom has provided. Let’s begin with my first argument. The Phoenix Wright: Ace Attorney Trilogy is a well-known staple in the visual novel and the detective genres. I can say with confidence that any fan of murder mystery stories will enjoy the trilogy. I would like to draw attention to exhibit A, records of the defendant’s Steam library. These records show the defendant has previously played the Danganronpa trilogy and the Zero Time Escape trilogy – two visual novel series known for their mystery and detective stories. Looking at the defendant’s play time, it’s clear that the defendant has completed these titles, and yet has the audacity to not have played the classic court drama that defined the very genre they claim to love. So I pose a question to the court: is this not a gross injustice? The defendant’s attorney will no doubt put forward that their client has played the later Ace Attorney games, such as the Apollo Justice series or the Miles Edgeworth chronicles. Although unquestionably worthy entries in the canon, the nuanced storylines and characters which they contain are best enjoyed within the context of the original trilogy. This is, therefore, a flimsy argument at best. 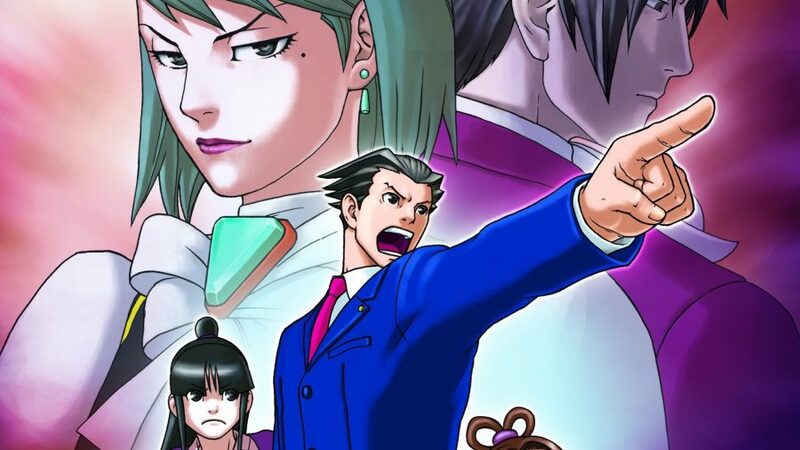 We’ve established that the defendant’s game preferences are perfectly in-line with the series, but what makes the Ace Attorney games such titans in the visual novel genre? Let’s examine the trilogy in further detail. In the Ace Attorney trilogy you play as rookie defence attorney Phoenix Wright on his journey through the justice system. 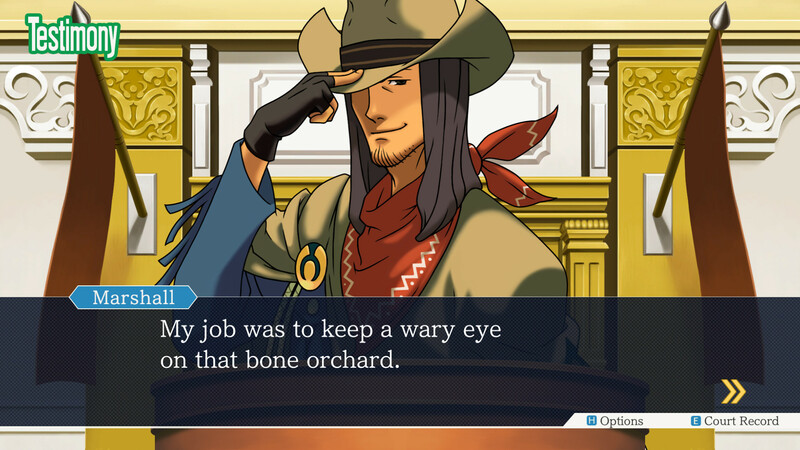 Casting you as Phoenix himself, each game has four to five cases in which you are tasked with investigating a client’s case and then defending them in court. Inspecting crime scenes, collecting evidence, and interviewing witnesses is all part of the investigation process. This phase gives you an idea about what went down and should start giving you some clues as to who the criminal is. Even if you think you may have the truth, the real investigation only begins when you walk into the courtroom – and I should know, because I am a 100% real, qualified law attorney. During the courtroom phase, you present your evidence, handling rebuttals from prosecutors, and exposing lies within witness testimonies to get to the truth. This structure of setup and fallout is a smart, unique way to unfold the mystery – adding flair to the drama and keeping you guessing until the end. The Ace Attorney series is known for turning a case on its head in the middle of a courtroom session. Although the series deals with some grizzly crimes that feature dizzying twists and turns, the Ace Attorney trilogy also boasts a special kind of comedy. An assortment of quirky characters including whip-wielding prosecutors, spiritual psychics, and bumbling detectives make up the series’ charming cast. Who could forget the groundbreaking test case in which a man refuses to remove his steel samurai mask while facing the charge of murdering another man with a samurai spear? The series may be cherished for its wealth of chucklesome moments, but the games deliver in other ways, too. As in all real court cases, as you get closer to the truth – cornering a witness based on a discrepancy in their testimony and then hammering your point home by presenting irrefutable evidence – rousing music starts to kick in and the tension rises. It’s a thrill every time. The trilogy delivers profound drama. Those haunting, bittersweet moments when you win a case but realise at the same time what was lost in the process – something every lawyer has to face. May I approach the bench for my final argument, Your Honour? Ladies and gentlemen of the jury, I will now highlight the changes that have been made in the trilogy as it makes its way to PC. It may please the court to know that the adaptation from Nintendo DS to PC has been a smooth transition. The graphics have been revamped and look as soft and smooth as the judge’s bushy beard, and the interface is simple and easy-to-use on just one screen. There are even multiple save slots, meaning you can hop from one game to another should you hit a temporary wall in one of your case files. There you have it, Your Honour. Given its gripping story, cast of quirky characters, unique gameplay, and a flair for the dramatic, the Phoenix Wright: Ace Attorney Trilogy is a must-play for any fan of visual novels, mystery games, or justice. I feel that I have, beyond any shadow of a doubt, proven that the defendant should play through the collection immediately. I rest my case.